There are so many exciting sights to see when visiting Fort Lauderdale. It just so happens that some of them are underwater! In a coastal city like “The Venice of America,” it’s no surprise that the ocean is an enormous draw for visitors. Our crystal clear, warm waters are full of coral reefs, tropical fish, and intriguing invertebrates! Snorkeling in Fort Lauderdale is one of the best ways to see this hidden, underwater paradise. Here’s everything you need to know about it! For more information about the other water sports and outdoor activities to enjoy during your vacation in South Florida, you can download our free Vacation Guide! Whether you’re looking to try your hand at surfing or stick to snorkeling in Fort Lauderdale, this valuable resource can help you plan an unforgettable ocean adventure! Why Go Snorkeling in Fort Lauderdale? There’s no shortage of ways to enjoy the motion of the ocean here in Fort Lauderdale. Surfing, scuba diving, swimming, jet skiing, boating, fishing, and kiteboarding are just a few of the countless water sports available in our area. Snorkeling in Fort Lauderdale is special, though. It doesn’t require any special certifications or skills, so it makes for a perfect family-friendly activity. Plus, the colorful glimpses of ocean life you’ll take in through your mask can’t be put into words! Why not come see for yourself? The Vista Park Reef is a hidden treasure, mostly known only by locals. A straight swim out from the Vista Park Beach in Fort Lauderdale is a magnificent coral reef. The Vista Park Reef is located about 1,000 feet from the shore. The water depth in this area is between eight and 20 feet, making it a popular spot for divers, as well. High tide provides the clearest water, and the reef itself features patches of coral, a multitude of sea fans, and scattered tropical fish. All you need is a dive flag and your snorkeling gear! The best part? It’s free! One of our favorite places to learn more about Pompano Beach snorkeling is the South Florida Diving Headquarters. This great local source features guided tours for diving and snorkeling as well as helpful maps and reef overviews for those looking to venture out on their own. There are several snorkeling spots offshore that can be reached by swimming or by boat. Just a quarter mile from sandy Pompano Beach, you’ll find the first reef. You’ll be snorkeling in just 15 minutes if you choose to explore Suzanne’s Ledge, the Hall of Fame, or Oakland Ridges! If you’re searching for free things to do in Fort Lauderdale, grab a swimming buddy, surfboard, and dive flag, then paddle out. Otherwise, it’s probably best to experience these spots by boat. About 175 yards off the shore of Hollywood North Beach Park are several two- to four-foot ledges. As one of the deeper snorkeling sites in Fort Lauderdale at 13 to 20 feet deep, this hidden gem boasts views of tropical fish, barracuda, tarpon, and even nurse sharks! The only price you’ll have to pay is parking in the metered lot. Of course, be sure to bring a dive flag and all of the appropriate snorkeling gear for the excursion. Sleep Comfortably after a Day of Snorkeling in Fort Lauderdale! Just 10 minutes away from some of these amazing snorkeling sites is our Serenity Place vacation rental in Imperial Point. This three-bedroom, two-bath house is a stunning, modern structure with all of the comforts of home! The chef’s kitchen is fully stocked, while the living spaces feature stylish, mid-century furnishings. The backyard is the highlight, however, which features a private, fenced-in oasis. 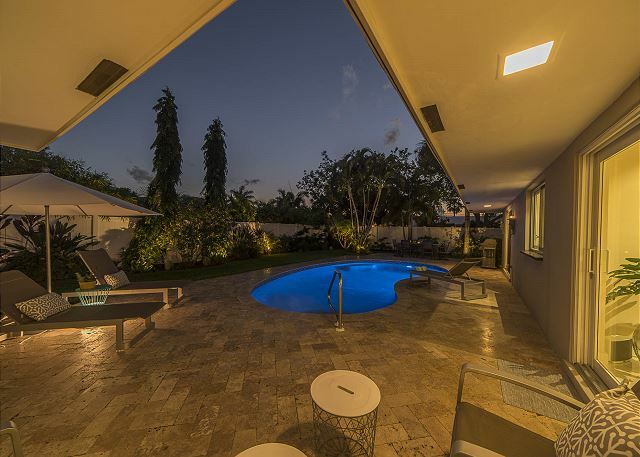 The heated pool and patio get sunshine throughout the day and is lit at night! After a busy day of snorkeling in “The Venice of America,” you’ll be able to retire to a comfortable bed surrounded by premium amenities. What could be better? What are you waiting for? Check our availability today and start planning your underwater adventure!